Variety, as they say, is the spice of life. It is also essential to building a productive NBA preseason schedule. Through the first three games of the exhibition season, the Thunder has been tested by the bruising physicality and rebounding prowess of a three-point gunning Detroit Pistons club. It has seen the prodigious talents of a new-wave franchise player in Minnesota’s Karl-Anthony Towns, surrounded by veterans. On Sunday, Head Coach Billy Donovan’s group battled against one of the youngest teams in the NBA in the Atlanta Hawks, with a dynamic point guard boasting unlimited range. On Tuesday, in the Thunder’s final preseason tilt, the Milwaukee Bucks will come to Chesapeake Energy Arena with one of the longest, most athletic groups in the league, headlined by star forward Giannis Antetokounmpo. As a fourth test for the Thunder this week, the Bucks will round out a group of opponents that have pushed and prodded the Thunder in different ways. The Thunder will certainly scout the Bucks and practice its normal game-planning habits to stay sharp while continuing the tutelage for the newcomers and youngsters on the roster. However, at this time of year for the Thunder it is much more essential to hone in on their own system, and trying to smooth out the miscues, missed connections and miscommunications that can happen during a game. "They're doing really, really well. Picking up things really fast." -Steven Adams on working with Nerlens Noel and Tyler Davis. 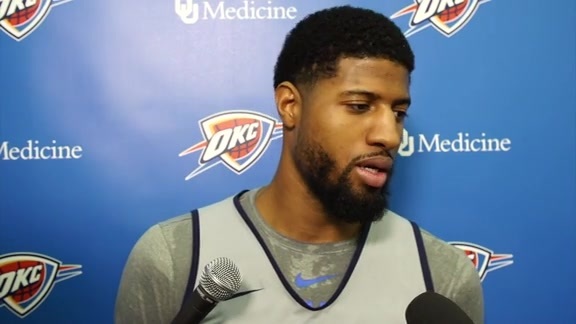 That process has been going well, despite the fact that the Thunder has had more than its share of injuries during U.S. Cellular Training Camp. Two starters in Russell Westbrook, Andre Roberson and Abdel Nader have missed every preseason game, Paul George missed one game due to a personal matter and Terrance Ferguson has had to leave early from two contests. Despite the adversity, the Thunder’s next-man-up mentality has served the group well, and the team has been able to press on in its growth as a unit. Donovan is a fan of the preseason slate the Thunder has this season, for more than just the assortment of flavors that the opposition has thrown at his team. To have four games in three different cities in a seven-day period is a fairly typical NBA week, and with another full week in between the final preseason game and the Thunder’s season-opener against the Golden State Warriors, the Thunder has an opportunity to dig into what worked and what must be improved before the games start to count. “We can take these four games and use that week to really look and evaluate the things we have to continue to grow in and get better in,” Donovan said. - The Thunder announced at practice today that second year guard Terrance Ferguson sustained a concussion on Sunday in the Thunder’s win in Tulsa. He will undergo the NBA’s Concussion Protocol and will miss the Milwaukee game. Russell Westbrook has been seen going through shooting drills at the end of Thunder practices, and completing some pregame work at the arena on game days. While he’s still on schedule for the original timetable to be re-evaluated four weeks after his arthroscopic knee surgery, Westbrook has been able to do some limited, controlled contact at practice. “Every day he’s progressing and he’ll be able to do a little bit more,” Donovan said. - A phrase that has been used around the Thunder frequently this preseason is playing “random” basketball, specifically on the offensive end. If the Thunder can avoid calling out plays, full of a specific sequence of actions, and rather call out a base set or concept and then freelance, the opposition will have much greater difficulty scouting and anticipating what’s coming next. “You have to have things in where guys can read how the defense is playing and they can move and cut and play freely based on what the defense is doing,” Donovan explained.